Growing up at the base of Snowbird in Utah, notorious for seriously deep power and ample blue bird days, pro skier and Smartwool athlete Angel Collinson got her start charging down the course as a ski racer. The allure of big mountains and wild places inspired Angel to pursue freeskiing and she’s been riding big lines around the world ever since. She’s competed in the Freeride World Tour and in 2015, she became the first woman to win Best Line at the Powder Awards for a jaw-dropping segment in Teton Gravity Research’s “Paradise Awaits”. We teamed up with our friends at TGR to bring you an intimate interview with Angel. 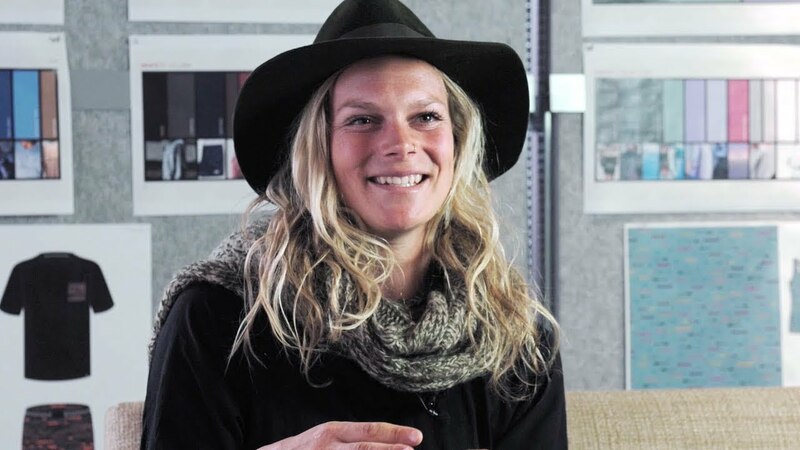 Fellow pro skier Hadley Hammer talks with Angel about designing the perfect sock, moments of greatness and spirit animals. Pros expect the best from their gear. So should you. Designed and tested in partnership with Smartwool athletes, the new PhD® Pro line of Merino wool socks features activity-specific sock technology designed to elevate human-powered adventuring in the mountains. Smartwool recently worked with Angel to create our most high-tech ski sock ever: the PhD® Pro Freeski. The Freeski features new insight-driven sculpted heel and ankle cushioning to help lock your foot in tight-fitting boots without adding bulk, making these comfortable wool socks ready to handle touring, resort shredding, and steep descents. I chatted with Angel to see what went into designing her new sock. Read on, put a pair on, and who knows? Maybe you too can ski like Angel. Hadley Hammer: I've heard you talk about how when you were growing up, your parents would tease you about being like “princess and the pea” because any tiny wrinkle or bump in your ski sock had to be fixed immediately. Is this rumor true? Angel Collinson: Yes. When I was a kid, we used to always have these crappy socks. We’d spend our summers on long adventures in the mountains, things like hiking all the U.S. volcanoes. It would take me three or four times of putting my socks and shoes on to avoid the dreaded crinkle. It would drive my dad nuts, so he started referring to me as the princess and the pea. HH: Fast forward 20 years later, and now you have a sock company letting you design the perfect no crinkle sock! What was that experience like? AC: Well for starters, I had no idea what goes into making a sock. It is far more than just weaving wool together, adding some cushion and stretch. The team at Smartwool puts in so much thought behind their designs, the fabrics, and technology. One of the coolest parts about being an athlete is getting to work with brands that really listen to our feedback and then integrate that into what they are making. On the one hand, our preferences are a bit personal as what we are doing in the mountains can be a little bit different than most, but on the other hand, we are using the gear to the extreme extent so we really get to notice the features or flaws. For the Freeski sock, we went through round after round of prototypes to find the perfect combination of fit and cushion for maximum comfort, which led to the final technical features. I love learning more about what goes into making the clothing that keeps your body warm and safe every day. Learning the why behind products is always so cool for me. HH: Can you talk a little about this sock in particular-besides from not bunching, what makes it great? AC: Skiing is such a unique sport and way of moving your body. Your sock is so key as it is the interface between your feet and your ski boots. Your boots are so important – it is where your feet connect with the snow and the earth. The sock is what keeps your feet warm and comfortable, and Smartwool isn't kidding in their slogan - the socks really do make your feet feel good. To achieve that feel good feeling, I first wanted to change up the cushion design. We did a zero-cushion toe for precision fit, added light cushioning in the heel to keep your heel warm and your ankle in place, especially while touring. We also cushioned the shins. However, I’ve noticed that a lot of times when socks have patterns on the shins, the tails of the thread can leave an imprint on your shin after a day of pressing into the front of your boot. For me, that can be uncomfortable, so we intentionally left the shins design-free. Using Smartwool’s IndestructawoolTM technology in the sock, we essentially took the PhD® line of socks, which has all the high end sock technology, and elevated it even further with the cushion design – making it the ultimate ski sock for both touring and skiing the resort! HH: Speaking of sock patterns, your socks are unique-they don’t match and have birds of prey on them. AC: Yes, I never have matching socks, so I wanted the pairs to have two different colors. Also, because of the way my foot is shaped, I like having a left and a right sock, and this way you can have a system if you want (I think “light on right” and the white one is always my right sock). Owls and other birds of prey are special to me. They have shown up in my life at very significant times. When I see one, it’s this sense of coming back to reality. The reality of what’s going on around me, what my inner head space is, how I’m feeling in my body. They are a reminder of life. HH: The PhD® Pro campaign is all about socks made for greatness, with socks created to meet very specific needs using athlete insights. In keeping with Smartwool's greatness theme, what’s your favorite moment of greatness in your career? AC: I think my favorite moments of greatness are when you can give to others things that are important to you, or that you have worked hard to earn. Maybe it’s in the field and it’s your turn to pick a line, but it’s really speaking to someone else, and you give them the best line in the zone... The moments when you transcend self-interest and give to the greater good – whether that be your team, your family, your community – that spirit of generosity is what comes to mind when I think of ‘greatness’. Also, when you overcome a challenge. Last year when we were in Albania, I was still battling some major fear demons, ones that I hadn’t quite yet overcome post-injury. There was this couloir that we were all going to ski - it was in the shade, and was really hard to tell snow quality. The last time I skied anything like that (a couloir that looked pretty easy and straightforward but hard to tell conditions) was when I took that 1,000-foot tomahawk that went viral on the internet. Sometimes moments of greatness are subtle. I wouldn’t say the line I skied that won Powder’s Line of the Year was necessarily a moment of greatness – I got to the bottom and was like, “that was fun, let’s go back up for another run.” But when I was standing at the top of the shady couloir in Albania, I was absolutely terrified, and it wasn’t necessarily rational. To overcome that fear and commit, even though it seemed to be an easy line, was a personal moment of greatness that took a lot of strength. HH: All of Smartwool’s PhD® and PhD® Pro socks are made in the USA using ZQ-certified Merino wool, a New Zealand program that ensures the highest-quality fibers while elevating animal welfare, environmental care, and social sustainability. You’ve always been a very environmentally and socially conscious skier, talk to me about how this brand is in alignment with your own beliefs. AC: We are in a very interesting time politically right now. I think now, more than ever, we need companies to set good ethical examples. Money speaks. We are all consumers – so we need to have products and brands to put our money behind that are thinking bigger than simply how to make more money by cutting corners and externalizing that cost on the environment. It’s a long road, but we have to start somewhere. I feel that Smartwool sees this importance of leading by example and setting new norms, new standards protecting not only the land, but its inhabitants as well. Looking for new socks this winter? Try out the ultimate in comfort: Angel's Smartwool PhD® Pro Freeski. Available here for men and women. Pros expect the best from their gear. So should you. Our new PhD Pro Freeski socks were created in partnership with Smartwool athlete and pro freeskier, Angel Collinson. We designed, reworked, retested, and dialed in our ski-specific technologies with Angel - bringing you what may be the best ski sock ever.